Desarrollado por la Oficina Central de Artillería Grabin en el otoño de 1943. El S-51 pasó con éxito las pruebas en la primavera de 1944, pero nunca se produjo en serie. Often nicknamed by the players as "The Unicorn" for the impressive long barrel gun it holds when aiming upwards, out of the box, it has the SU-14-1's upgraded gun. It's rather slow when you first get it, and performance will be sluggish, but once upgraded, its mobility kicks in. Most players agree that the S-51 is superior to the SU-14-1 for these reasons: its mobility (especially when relocating to avoid becoming a counter-battery target), its agility in running from danger, and faster traverse speeds in switching between targets. 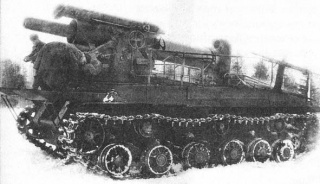 It also has a smaller profile than the SU-14, which helps it with camouflage. S-51 starts with 152 mm BR-2 Howitzer, which considering its repositioning in 8.6, makes it comparable to the old SU-8. However, the second gun, the 203 mm B-4 is the cannon that your enemies will fear you for. It gives the S-51 the ability to deal more alpha damage than any other Tier 7 SPG, and even deal one-shots to Tier 8 heavy tanks. On the downside, it has a very slow reload time and it is rather inaccurate. Its large splash radius will nonetheless ensure that your opponent receives at least some kind of damage. The 203 mm B-4 canon can only carry 12 shells, which in most cases is enough thanks to the low rate of fire. It can also fire AP shells, which some people may find handy in close quarters combat for their high damage potential and good penetration. Since this Artillery is researched directly from a Heavy Tank, new players that are inexperienced with artillery mechanics can find it frustrating to use due the long reload times and very low ammo capacity. Many agree that using this tank requires a mandatory use of a Large-Caliber Shell Rammer and an Enhanced gun laying Drive module. When using this Artillery, it's best to relocate after a shot as the reload time is long and relocating prevents counter-battery fire from enemy artillery. The relatively good agility of the S-51 makes relocation a fairly simple task. It's a good idea to have one or two AP shells. They can save you from incoming scouts that trespass into your base or severely damage Heavy tanks like the E-75 for its consistent damage (assuming you don't miss). As of 8.6 engines are unique - the V-2IS has been replace for this tank. The first prototype of the S-51 entered factory tests in February 1944, conducted under the reduced program. However, interest in high powered artillery was so great that it was still not finished was transferred to ANIOP. Here, all of the major disadvantages of the S-51 were revealed. Because of the high line-of-fire when firing, the self-propelled chassis was strongly swayed by inertia and would move to a lateral displacement. The elevation angle was relatively small, and the recoil was so strong that the crew could not hold on their seats. The severe recoil, large size and weight of its projectiles, and the extreme discomfort for the crew would require the installation of a rammer/loader. In addition, the chassis of the KV-1S proved it was clearly not a good platform on which to install guns of this caliber. After comparing all the data obtained in the COD, it was felt that the S-51 still be sent to production, but to no success. First of all, the issue of using KV-1S chassis was resolved in December 1942: the required amount of modifications for heavy self-propelled guns was only possible with the serious alteration of serial machines. Another important reason was the lack of the B-4 howitzer, which was not in production-scale numbers.